Maddie Schorlemmer, psychology senior, plays her final regular season home match at the tennis center April 22, 2016. Schorlemmer defeated Lindsy Pearce (University of Arkansas-Fort Smith) 6-2, 6-2. 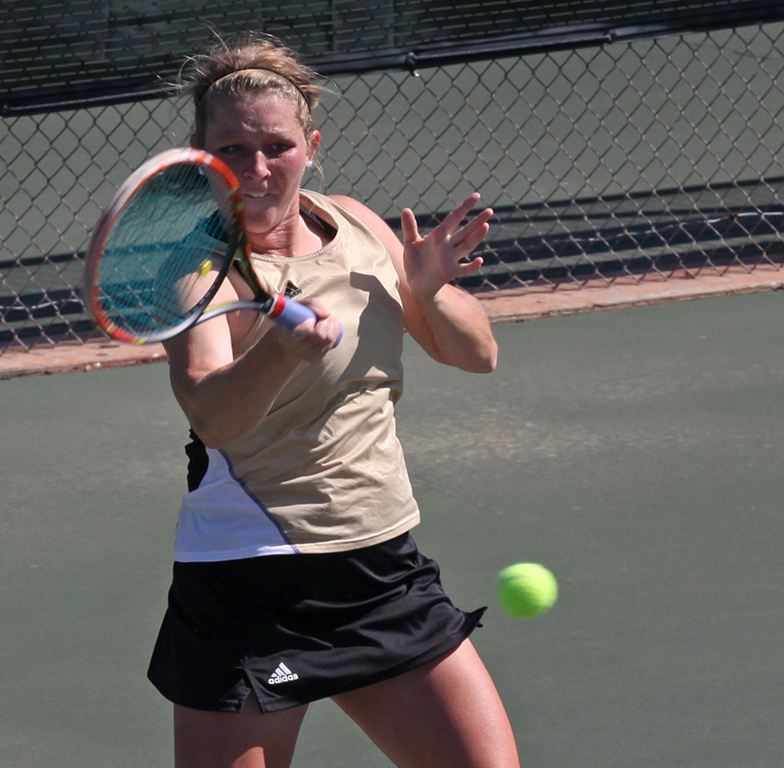 In doubles play, the next day at Northeastern (Oklahoma) State, Schorlemmer (above) and junior Abby White beat NSU 8-0. The Academic Excellence Award is an honor granted to teams within the Lone Star Conference. Each year, student-athletes compete for the award presented by Balfour by striving for the highest team grade point average. In the process of determining the sole winner across all sports, each individual sport is recognized for its highest team GPA respective to each gender. In the past five years, Midwestern State has appeared two times, once in men’s tennis (2014-15) and again in women’s tennis (2015-16). Dominated by other institutions such as West Texas A&M and Eastern New Mexico University, Midwestern State fails to compete for this award. Greg Giddings, assistant professor and faculty athletic representative, said he was surprised to find the athletic programs were not frequently contending for the award. “I’m surprised that occasionally we don’t compete a little bit more against other institutions. The student-athletes typically do outperform the student body as a whole, but it is disappointing that we’re not at an elite level more frequently than we are,” Giddings said. Giddings emphasized the primary importance remains in ensuring the education of the student-athletes is beneficial and thorough even though the lack of competition is displeasing. “Yes, it would be nice to win those awards, but I think it’s more important that we do a good job regarding the education of our student-athletes and I think we do that here,” Giddings said. Head men’s and women’s tennis coach Scott Linn said he believes several different factors contribute to being outperformed in the academic arena. Linn also said recruiting the right people plays a big role in the academic success of the team. Giddings said recruiting can contribute to academic results. He said that a coach’s job presents significant challenge in finding a student-athlete who can contribute positively in both academics and athletics. Giddings said financial differences between each university could potentially uneven the playing field. Head women’s soccer coach Ryan Spence also highlighted financial aspects contributing to academic results. He said because of the university’s relatively low tuition, a particular demographic of students is generated here than at other schools within the conference. Spence said he believes this factors in to the equation as well. Spence said consequences for poor academic performance were lacking in previous years and are a work in progress. Amanda Snodgrass, assistant ahletic director of business and finance, said along with stricter penalties, administrators are also implementing more programs to aid student-athletes in their academic endeavors. Being the only university in the Lone Star Conference that does not have priority registration for athletes, Linn said this also presented itself as a possible influence regarding low team GPAs. Along with scheduling conflicts, Giddings noted that overall rigor of a student-athlete’s class schedule can contribute to the issue as well. “It could be as simple as some of our student athletes take challenging majors. They’re not here to coast through. It’s not like they’re here to just to play a sport and participate. They’re here to get an education, and, in doing so, they challenge themselves,” Giddings said. 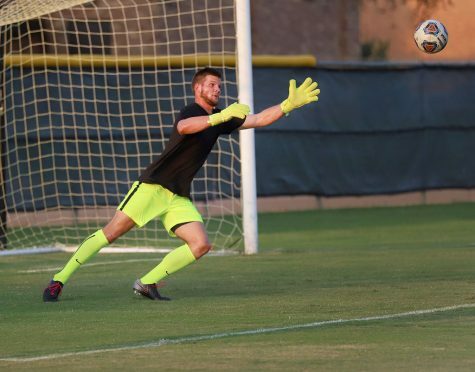 Taylor Lampe, exercise physiology junior is a member of the men’s soccer team. He stated much of the responsibility for academic success falls on the student-athletes themselves. “Athletes need to be doing stuff on their own. We need to be able to go into a classroom and get help from a teacher or from another student or go to an S.I. session (supplemental instruction). I think it’s more on the student-athlete themselves,” Lampe said. Although the award provides no monetary value, Spence said it is still important to compete for it within the conference. “At the end of the day, that’s another trophy you fight for,” Spence said. Spence emphasized the importance of grades during a student-athlete’s collegiate career. While sports occupy much of the athlete’s time and energy during college, Spence believes it is important to prepare for what comes after school. “You could say that grades don’t matter as long as your eligible to play but that’s not true. At the end of the day, we are setting student-athletes up to do something after their collegiate career,” Spence said. Giddings said finding the balance between academics and athletics can be difficult, but it is one of the main concerns of the athletic faculty and staff. Great read, very well done. Insightful and touching.